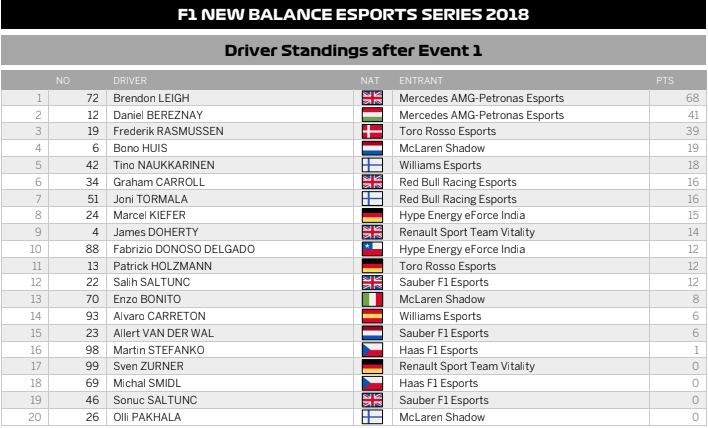 The F1 New Balance Esports Pro Series 2018 got off to a flying start in London on Wednesday, with the opening three races of the competition providing levels of excitement and drama that have set the bar very high for the remaining live events of the Pro Series. At the centre of it all were the nine official F1 Esports teams, competing against each other in F1 Esports for the very first time. Representing them were their chosen drivers, who rose to the top from more than 66,000 online entrants, as the battle for crucial points got under way in the quest for the team and individual championship titles. Races Two and Three were streamed live on the official F1 Facebook page and on F1Esports.com as well as on TV networks across numerous countries throughout the world. On social media, the event has reached two million people and generated 1.2m views to date. Host Tom Deacon was joined on the panel by former F1 driver Jolyon Palmer and by Lando Norris, who will line up on the F1 grid for McLaren in 2019. There was also a special guest appearance from Toro Rosso’s Pierre Gasly, who fought off his post-Japanese Grand Prix jet lag to follow the action in person. Plenty of talk in the build-up was focussed on the 2017 F1 Esports Series winner, Brendon Leigh. At the media day 24 hours earlier, he had shrugged off suggestions that he might be feeling any additional pressure as the defending champion. In the colours of his favourite F1 team, Mercedes AMG-Petronas Esports, would he still be the man to beat? The answer proved to be a resounding yes, as he ended the opening night on top of the driver standings with seven races still to come. Leigh dominated Race One, at Melbourne’s Albert Park, starting from pole position and claiming victory ahead of his Mercedes teammate Daniel Bereznay, who would eventually be demoted to P6 after a penalty. A scorching lap from Bereznay at Shanghai meant that Mercedes were on pole again for Race Two. Once again, however, it was Leigh who took the chequered flag, winning from P5 on the grid and extending his lead in the championship standings. There were some phenomenal efforts further down the field, notably from Haas driver Martin Stefanko. After struggling in qualifying he started from the back of the grid, but fought his way through the field to claim P10, and with it a points finish that seemed so unlikely at lights out. The tight streets of Baku City Circuit can prove to be as unpredictable in F1 Esports as they are in Formula 1, so the tension ahead of the final race of the opening night was cranked up a notch for Race Three. Chasing a clean sweep of race wins, Leigh started from P4, next to Rasmussen on the second row, with Bereznay beating Patrik Holzmann to pole position. What unfolded over the following 22 minutes can only be described as epic. Momentum swung from one way to the other at the front, and as Leigh approached the final corner with a narrow lead, that clean sweep looked a formality. But Rasmussen dug deep down Baku’s long finishing straight and, incredibly, found enough power to force his way past the Mercedes metres from the line – clinching a dramatic victory by just nine hundredths of a second and rewriting the ending to the 2018 Pro Series’ incredible opening act.